If you’ve ever been in a gym, the chances are you’ll have come across the Commercial Gym Equipment Concept2 Indoor Rower. (MINIMUM order QTY x 5 on all pre owned concept 2 rowers) The best-selling rowing machine in the world, the Indoor Rower can be found in gyms, rowing clubs, schools and Olympic training centres around the world. It’s rare to find an activity that works as many muscle groups through as wide a range of motion as rowing does. Knees, hips, arms and shoulders will each see 90 – 130 degrees of rotation in every stroke, which is more than you’ll find in most other aerobic activities. This greater muscle involvement makes rowing a fantastic calorie burner, while also developing flexibility and strength. Rowing is impact-free, and the intensity is completely user-controlled, meaning you can row as hard or as easily as you want, making it suitable for people of all ages and all walks of life. Thousands of customers each month have found rowing to be the best low-impact, full-body workout available. One of the biggest reasons behind the machine’s success is the Performance Monitor. 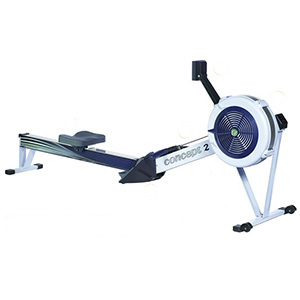 A highly sophisticated piece of equipment, this helps set the Indoor Rower apart from other fitness equipment as it allows you to accurately compare times and distances between different machines and users. Not only does this mean it’s possible for you to reliably chart your progress, but it has led directly to the creation of an ntire sport. Flywheel: The ABS squirrel cage fan is fixed to a steel flywheel. This assembly is fully enclosed. Easy menu-driven operation accesses a powerful list of features. Row with an animated rower to help you learn rowing skills.